Hayani Country Stay is situated on farm Nooitgedacht, ten kilometres from Heidelberg, situated along the N3 highway to Durban. It is ideally suited for family breakaways or business stays as it lies within easy reach of Johannesburg, the East Rand, the Vaal Triangle and Pretoria. Only a 15 minutes drive to the Heidelberg Mall which boasts a woolworths store and a variety of restaurants. Here visitors can enjoy hiking into the hillocks of the Suikerbosrand where interesting rock formations await them. Expect to see wild cosmos in March, various species of aloe and a burst of wild veldflowers in springtime. Also look out for the rare Heidelberg Copper Butterfly, discovered at Heidelberg in 1959. Other activities on the farm include bird watching, hiking and swimming. Come and experience country hospitality in Heidelberg! 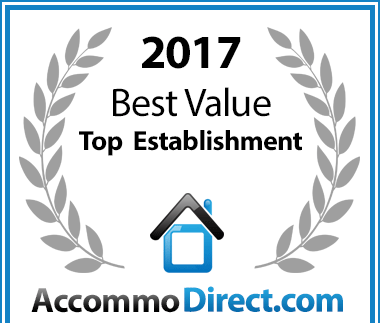 For accommodation in Heidelberg Hayani Country Stay has been voted a Best Value establishment.